Apple employees are reportedly testing Apple Pay Cash, the company's take on peer-to-peer payments, as part of an internal evaluation of the service ahead of an anticipated release later this fall. According to MacRumors forum member Chuck SaaS, an unknown number of Apple employees were recently issued a special device certificate to enable testing of the upcoming Apple Pay feature. The company is encouraging employees with access to both iOS 11.1 and the device certificate to use Apple Pay Cash amongst themselves prior to a public launch this fall. The forum member is reportedly in contact with an Apple employee selected to test Apple Pay Cash, and shared two screenshots of the system in action. 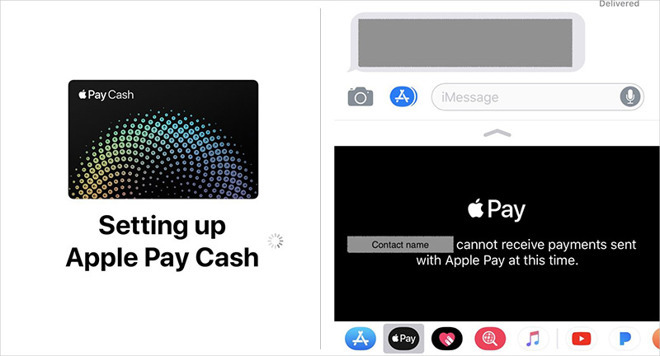 The first is a basic setup splash screen with a graphic of an Apple Pay Cash card, while the second shows a dialogue box consumers can expect to see when a transfer fails. In this case, the unnamed Apple employee attempted to send a payment to Chuck SaaS, but the transfer was declined because the forum member's device lacked the appropriate credentials. That Apple is testing Apple Pay Cash within its own ranks suggests the service could launch with iOS 11.1 in the coming weeks. Exactly when the point update is due to hit Apple's servers, however, is unclear. Unveiled at Apple's Worldwide Developers Conference in June, Apple Pay Cash is a P2P money transfer system authorized by Apple Pay. Integrated into a Messages app, the service allows iOS device users to send payments that are stored on an Apple Pay Cash card, the balance of which can be used to pay for Apple Pay purchases or transferred to the user's bank account. Users can provision both credit and debit cards for use with the service, but only debit-based transactions are free. Like other P2P solutions, using a credit card to send money incurs an industry standard 3 percent fee.